Just as the trees begin to lose their leaves as fall approaches, NASA's Jet Propulsion Laboratory in Pasadena, Calif., loses a part of its staff, the summer student interns. Approximately 450 students were at JPL over the summer to participate in the more than 20 summer student research programs offered through JPL's Education Office. Each student worked with at least one mentor. Students came from all over the country, large and small colleges and universities, community colleges, high schools and even foreign universities; from as far away as Oxford and as close as Glendale Community College. Phoebe Sulzen, a junior mechanical engineering major at Cal State Los Angeles, found being a member of the Mars Science Laboratory team an "amazing" experience. "Being a part of a professional work environment reinforced the love I already had for the challenge and excitement that goes with engineering," she said. "I am looking into finding an internship for next summer in a different section so I can get experience in other areas." Working in the Verification, Validation and Operations Group, Sulzen's internship was through JPL's Summer Minority Internship Program. Sulzen's mentor, Tracy Van Houten, has mentored about 20 students in her eight years at JPL, including three this summer on Mars Science Laboratory. She said the time and effort are worth it. "Plus, the students all work so quickly," she said. "I often assign tasks that I think will take a week and they are done within a day. I really enjoy the vibrancy and freshness all the students bring to the Lab each summer." Kim Whitehall, who worked in JPL's Graduate Fellowship Program developing metrics for the Regional Climate Model Evaluation System, feels her JPL stint has helped bring together academic theories and practical applications of her knowledge. "Working at JPL allowed me to bridge classroom theories with real-world practicalities," she said. Whitehall is now pursuing a doctorate in atmospheric sciences at Howard University in Washington D.C.
"For many of the students, a JPL internship is their first experience working at the frontier of science, technology or engineering," said Adrian Ponce, manager of the Science, Technology, Engineering and Mathematics (STEM) Higher Education Group and principal investigator on astrobiology and biodefense research projects at JPL. "Their work is a powerful and transformative experience and really motivates them to finish their STEM degrees and pursue those types of careers," Ponce said. 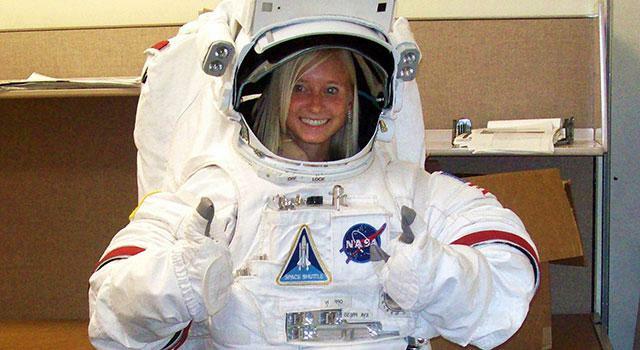 After spending time on Lab, many of the interns want to pursue careers at NASA. 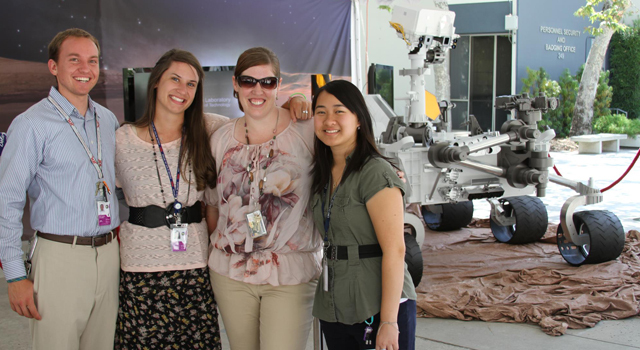 This summer JPL had more than 60 interns considered by hiring managers for positions. Indeed, Brian Schratz, a two-time summer student from 2005 to 2008 in the Graduate Student Research Program, was hired into the Communications System and Operations Group in 2009 and is currently working with the Mars Science Laboratory team. "I interned at a few different places, including other NASA centers," he said. "After the first summer at JPL, I was hooked. As a full-time JPL employee I'm loving every minute of it." "For JPL, the benefit comes in unbridled enthusiasm that is injected into the Lab during the summer months," said Ponce. "That enthusiasm is put to good use by our mentor community, which is illustrated by the fact that 10 percent of all the peer-reviewed publications coming from JPL have student interns as co-authors." "When these interns are hired, they will need little or no orientation and training to begin their careers at JPL, which is another cost-saving benefit of internship programs," noted Parvin Kassaie, manager of JPL's Education Office. "They start with a base of experience, a network of connections and a loyalty to JPL that will continue to benefit the Lab and form the foundations of a successful career," Kassaie said.